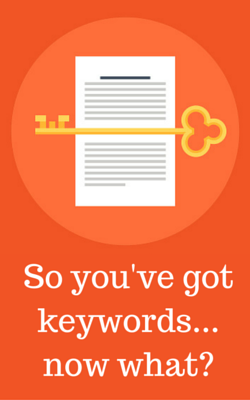 You’ve got keywords, but do you know how to use them? So you’ve completed some keyword research and you know which words make sense to try to rank for. You have created a solid keyword strategy to boost your website’s search rankings and SEO. Now what? Many marketers get that deer-in-the-headlights look when asked how they use their keywords. Are you one of them? If so, here is information you can use today to start seeing some value from your keyword research and well-crafted SEO strategy. Comprised of just a simple set of words, these keywords represent broader searches. For example, one might search for information about marketing or inbound marketing. Searches using short-tail keywords will deliver a landslide of diverse results. Some results will be relevant to what the searcher is looking for, but many will not. These keywords include longer, more specific phrases and generate results that are (hopefully) more relevant to what the user is looking for. An example of a long-tail keyword would be “inbound marketing agency in Nashville, TN” or “how to get started with inbound marketing”. Whether they are short-tail or long-tail, what defines these keywords is that they have a limited shelf life. In regards to your company, your brand, your campaign or whatever you intend to use it for, this keyword isn’t something you can or should use forever. Good examples would be the name of an event you’re involved with, like “HubSpot INBOUND 2015” or subject matter that is important to your company right now, like “growth hacking for inbound marketing”. Other keywords are representative of your business long-term; they hold their value for long periods of time. They’re foundational to your products or services. Using IMA as an example, some evergreen keywords might be “HubSpot partner agency in Nashville” or “inbound marketing strategy provider”. Once you have an understanding of the different types of keywords you have to work with, you can get strategic about how to use them, which we will get into next. Short-term keywords are great for campaign-related content, like blog posts. Use them to create a content calendar so your blog is making good use of your keyword research. It’s important to focus each post on one primary keyword and possibly a secondary keyword. Think of questions your prospects might ask that include these keywords. Write a blog post to answer that question. Create a landing page around an event, campaign or offer and optimize it for a related short-term keyword. While landing pages are currently the destination for people who click links in emails or social posts, they can also be optimized for SEO using relevant keywords. Wouldn’t it be great if someone stumbled upon your landing page as the result of a web search and ended up becoming a lead? Evergreen keywords are great to use in optimizing the copy on your website. Comb through the pages on your site and look for ways to incorporate relevant keywords. Focus on pages that may not performing so well now and could use a boost. You’re not done yet! Go through your website once more. This time, though, look at your meta data. Make sure you’re using each page’s keyword in the meta description, in the alt tags for the images on the page and in the text that uses H1 tags. Ensuring each page’s meta data is in line with the on-page keyword optimization will help improve its overall SEO. While you’re at it, be sure you’re using the keywords the right way. Abusing your keywords can actually end up causing more harm than good. “Well that’s a scary thought”, you may be thinking, “How am I supposed to know if I’m abusing my keywords?” Just remember to focus on one or two keywords per page. You don’t want to confuse your site visitors – or Google – by peppering in a mix of keywords. Keep your content and meta data focused on a single topic. Use your chosen keyword enough to make it clear to the reader (and search engine) what the page is about, but don’t use it so much that you sound like a broken record. Just be natural. That list of keywords isn’t going to do you any good unless you use it. So get it organized and put it to work!